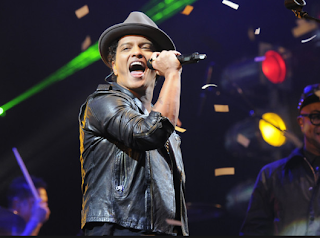 Is Bruno Mars big enough to play the Superbowl Halftime Show? This question has been circulating since Friday when a source said that the singer was going to be the main act at this year's big event. Well, it has since been confirmed so debating it is pretty futile at this point...but one can only wonder. What were they thinking? Madonna, Beyonce and then...Bruno Mars. I don't dislike Bruno, but is he in any way as successful as one should be before headlining the halftime show? I think not. How is he going to upstage the Destiny's Child reunion of 2013? He isn't. I am already making plans for Superbowl Sunday that do not include watching football. Side Note: For you sake, people who will watch the performance, I hope he loses his love of ugly hats before the show.